You can help support the Vietnam Veterans Memorial Fund in our mission to preserve, honor and educate. Whether it's an online donation, a gift of stock, planned gifts, donating your car, or simply buying something on Amazon.com, there are many great ways you can help. Additionally, make sure to check with your employer, whether you are retired or still working, to see if they will match your support to VVMF through their matching gift programs. Looking for a way to honor the service of Vietnam veterans while planning for your future? Consider making a planned gift to the Vietnam Veterans Memorial Fund (VVMF). It’s easy to do and with a little advanced planning, you too, can increase your personal wealth while making a meaningful contribution that will help others remember the brave men and women who served in Vietnam for years to come. Whether you are interested in remembering VVMF in your will, giving gifts of stock or real-estate, or are considering a long-term gift annuity, all provide great benefits to you, your family and to our organization. The Vietnam Veterans Memorial Fund (VVMF) is excited to announce the launch of its first online merchandise store at vvmf.org/store. The VVMF store has a range of other items available for purchase, including name rubbing frames, The Wall That Heals and In Memory memorabilia, and more. There are more than 58,000 names inscribed on The Wall and each of them has a story you can help keep alive. When you browse the online store you can learn how to display your pride in the Vietnam Veterans Memorial. A portion of every item sold will go to support VVMF’s mission. Many workplaces—including private companies, military organizations, and the government—coordinate charitable giving campaigns for their employees. These campaigns allow employees to donate to charities of their choice through one-time gifts and regular payroll deductions. Many of these campaigns take place in the fall, and they are a great way to contribute to Vietnam Veterans Memorial Fund. Military and federal employees can give through the Combined Federal Campaign (CFC). VVMF’s CFC number is # 11070. Your office may also collect donations through an organization called America's Charities or through the United Way. Look for VVMF by name (or by ID #52-1149668) through these organizations. Or, simply designate Vietnam Veterans Memorial Fund in the space on the form provided by your company. Many companies allow you to pledge online, too. Wall Magic is a collection of stories related to the Vietnam Veterans Memorial (The Wall) and the volunteers who serve there. Order your paperback copy or kindle edition today! AmazonSmile is a simple and automatic way for you to support VVMF every time you shop, at no cost to you. When you shop at smile.amazon.com, you’ll find the exact same low prices, vast selection and convenient shopping experience as Amazon.com, with the added bonus that Amazon will donate a portion of the purchase price to VVMF. If you already have an Amazon.com account, you are all set. Vist http://smile.amazon.com, select the "Vietnam Veterans Memorial Fund" and you're done. Do you have a vehicle you'd like to donate to The Vietnam Veterans Memorial Fund, while receiving a tax deduction at the same time? It's easy, and the Memorial Fund will receive 50% of the net proceeds. Just visit www.donatecarusa.com. * The Vietnam Veterans Memorial Fund is a nonprofit organization under Section 501(c)(3) of the Internal Revenue Code. All donations are tax deductible to the full extent permitted by law. 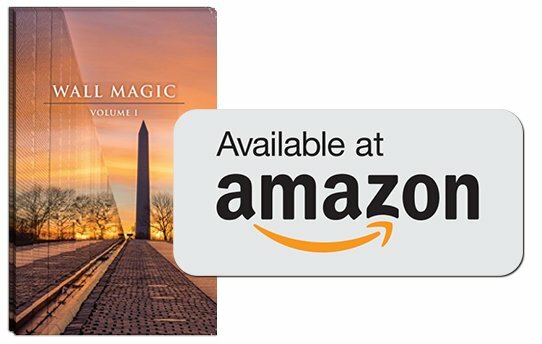 Wall Magic: Volume 1 is available now on Amazon. These “Wall Magic” stories were submitted from our volunteers so that you can experience it for yourself.